Son of Thomas Watson Randall and Rutha Ella Farmer Randall, William “Bill” Randall was born about 1901 in Franklin County, Georgia. William “Bill” Randall married Nell Tate (born December 19, 1891 in Center (Oconee County), South Carolina), the daughter of Perry Tate & Liza Jane “Janie” Tate. 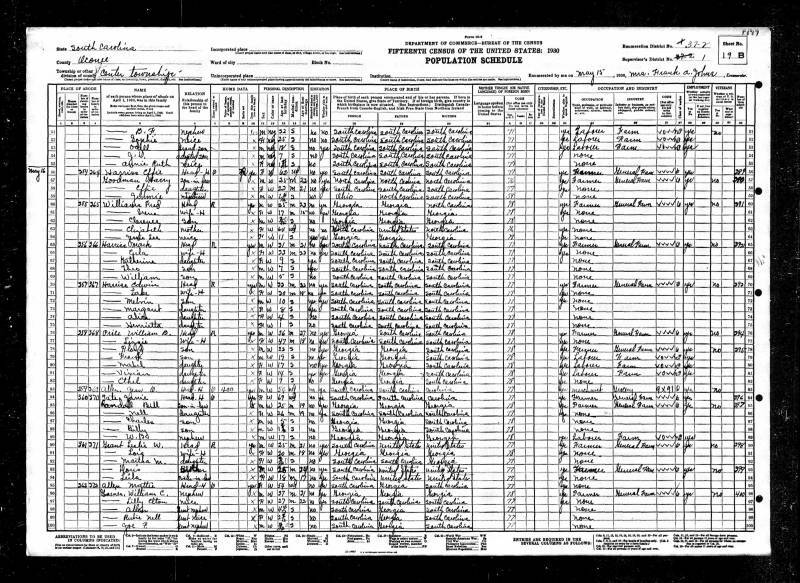 At the time of the 1930 U.S. Census, William “Bill” Randall and Nell Tate-Randall, along with their children AND Bill's nephew, Walter Baxter "Dub" Randall, were living with his mother-in-law, Liza Jane “Janie” Tate, in Center (Oconee County), South Carolina. 1930 U.S. Census. Janie Tate's family begins on line 84. Notes: Charles & Billy Randall were obviously intended to be listed as Bill & Nell's sons (should have been listed as Janie's “Grandsons”. And W.B. Randall was obviously Bill's Nephew… with no relationship to Janie Tate.